On the surface the business of wholesale distribution might appear deceptively simple. It’s simply a question of moving product from point A to point B, right? Wrong! Distributors routinely walk the equivalent of a business tightrope, balancing the needs of customers across a complex supply chain, with little or no safety net. The need for speed, transparency and collaboration make them the perfect candidates and yet Mint Jutras research finds wholesale distribution lagging behind other industries in digital transformation. The vast majority (80%) of wholesale distributors agree that digital technologies are truly transformative in the way they connect operations to systems such as Enterprise Resource Planning (ERP) and 93% agree they are necessary for survival. And yet almost half still rely at least partially on spreadsheets and/or manual processes for maintaining their operational and transactional systems of record. 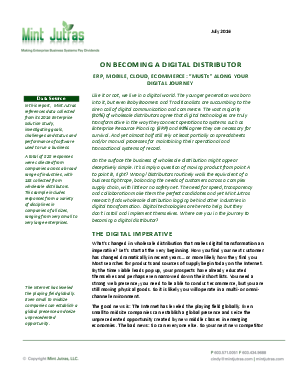 Where are you in the journey to becoming a digital distributor? In this report, Mint Jutras references data collected from its 2016 Enterprise Solution Study, investigating goals, challenges and status and performance of software used by wholesale distributors to run their businesses. Dowload to learn more.